Is there surgery on your calendar to repair an injured anterior cruciate ligament (ACL) in your knee? You're not alone: This vital bit of connective tissue gets hurt easily. Fortunately, a torn ACL almost always can be repaired arthroscopically—meaning a surgeon will need to make just a few small incisions in order to insert a tiny camera and surgical instruments around the ligament. This is much less invasive than opening up the knee entirely, less risky, and easier to recover from. That said, arthroscopic ACL surgery is not a walk in the park. Here's what you need to do beforehand to make it as easy on yourself and your surgeon as possible. Discuss your diagnosis. Go over all the details of your injury and upcoming surgery with your surgeon. Make sure you understand what caused it and are clear about any other treatment options. Ask questions. Make sure you understand the potential risks, limitations, and benefits of the ACL surgery. Talk with other patients. Ask around to find someone who's had the same surgery you're about to have. It's a great way to find out how they felt and especially to get tips for dealing with any practical issues you'll be faced with as you recover. Understand the surgery. Ask your doctor for details about how the surgery will be performed, and set appropriate expectations for both the day of surgery and the amount of time you will need to rehab. Take good care of yourself. The healthier you are before surgery the stronger you'll be during and after. Stop smoking, eat as healthfully as you can in the weeks leading up to your procedure, and follow your surgeon's instructions to the letter. If he advises you to stop taking any medications beforehand, be sure to do that. Stay strong. It's likely there are some activities you can continue to do even after you've injured your knee to help you stay in good physical condition before your surgery. Doublecheck with your doctor, but you should be able to swim or ride a bike without causing more damage to your knee. At the same time, make sure you're clear about what you can't do safely. Practice using crutches. 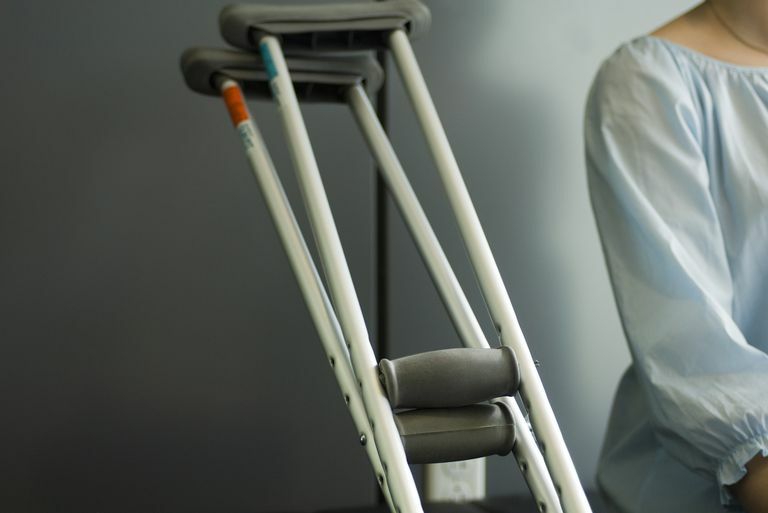 Some surgeons advise patents to get comfortable using crutches in the weeks prior to surgery. It can be easy to fall or stumble with crutches if you aren't used to them. Let your surgeon know if you get sick. If you catch a cold or some other infection in the days leading up to your ACL surgery, tell your surgeon right away. It may be a good idea to delay the operation until you're completely recovered. Follow pre-op instructions. Some of these may seem silly—you'll be told what to eat and drink and when, for example—but they're important. If you don't understand the reason for a particular instruction, ask. Often knowing why you need to do something will make it easier to follow through. Get a ride. ACL surgery is typically an outpatient procedure and you will go home the same day. Because you will be on medications, you'll need someone to drive you home. Dress for rest. On the day of surgery, wear comfortable clothing. Choose sweatpants or some other legwear that will fit comfortably over your knee bandages or brace. Try to relax. Use relaxation exercises or podcasts to maintain a confident and relaxed state of mind and reduce any anxiety you may have about undergoing surgery. Don't go it alone. Have personal support with you. Bringing a friend or loved one is a good way to help you stay relaxed before and after surgery. Plan ahead. Keep in mind that you will be less active for six to eight weeks after the surgery. Arrange for friends and loved ones to help out, hire a housekeeper to keep your home tidy or do laundry, a temporary babysitter to take care of the kids or chauffer them to after-school activities, sign up with a grocery delivery service. Keep other people posted. Inform anyone who needs to be aware of your limitations after surgery. Notify your employer, school, or team to make necessary arrangements in your schedule. Contact your insurance provider. Make sure you know what will be covered and what won't, so you don't find yourself surprised by unexpected medical bills.